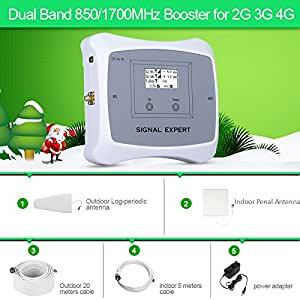 *The signal booster device can only boost the mobile signal from base station and amplify your signal.Antenna can be installed outdoors above the roofline or indoors in the attic or near a window. *It can improve the voice quality faster and link the date together in your home, office,basement,garage,basement and so on. *The mobile signal Amplifier ‘s Coverage Range can up 3500-5000 square feet of coverage.Can handle weak mobile network signal and enjoy the free time. *Work with all major carriers:such as AT&T,T-Mobile,Sprint Corporation,Verizon,U.S.Cellular and so on. Features by us: 1)*High gain repeater and could coverage 3500-5000 Square feet,the gain could up to 70dB.with nice looking,best price and high quality. 2)*It can improve the voice quality faster and link the date together in your home, office,basement,garage,basement and so on. 3)LCD screen display and automatic to adjust the system gain detect the obstacle about the surrounding and show the solution and how to deal with it. 4)*Easy to install and with the best guide.Meanwhile, it can also boost the speed of GPRS. Warm Tips: 1.Before order please make sure the mobile signal frequency can cover your area. 2.This cell phone signal booster can only make the weak signal stronger,it can’t create signal. that’s means it won’t give you any help in an area where there is no signal at all. 3.You can use your mobile phone to test the signal strength in your hone, Iphone mobile: Please dial *3001#12345#*,and find the signal strength show in the top left conner of the phone. Android mobile :Please dial *#*#4636#*#*,to check the signal strength, normally -60 – -80 the booster could work well.